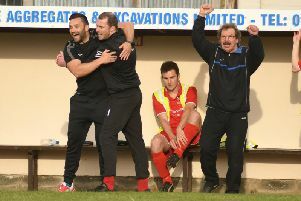 Bridlington Rovers dug deep for a 3-2 home win against local rivals FC Lodge to stay top of East Riding County League Division Two. Lodge came out of the blocks like they were placed top rather than eighth as they dominated proceedings. First to everything and stronger in the tackle, Lodge looked the more likely to score. It was the away side that forced an early scare for Rovers with a neat run from the Lodge winger creating an opening for the forward to blast wide. Rovers were trying to move the ball around, but Lodge’s pressing made it hard for the home side to find their rhythm. Lodge deservedly got their goal with a ball over the top for the forward to roll under Rovers keeper Callum Flowerdew. Although the forward looked offside, the ref thought otherwise. The ref then gave a free-kick for a foul on the Lodge midfielder, allowing the taker to take it three times to everyone’s amazement. The first two efforts hitthe wall, with the final effort pinging off the crossbar. Rovers were finding top gear at times and were creating opportunities, but were trying to force it. However, they eventually got a little bit of luckas Nathan Bristow made a dazzling run into the Lodge box, only to be hacked down and the penalty to be awarded, and up stepped Bristow to convert and go in at half-time level. This fixture was definitely a game of two halves and Rovers were asked at half-time to move the ball quicker and responded in excellent fashion. With some lovely pass-and-move football, Rovers began to control the half. All the pressing Lodge gave in the first half soon tired them early in the second period. Rovers took advantage with great movement in midfield and Josh Pilmoor found himself in acres of space. With no attempt to close him down, he hit a sweet drilled effort into the bottom corner that the keeper had no chance of reaching. By this time Rovers were on point and playing football as they have tried to do all season. Lodge did hit Rovers with the counter-attacking long ball, but Flowerdew, Bailey Alves and captain Liam Banks were outstanding at the back tidying up calmly any threat Lodge offered. On three occasions, Banks came dribbling from the back through the Lodge midfield with conviction, but his decision in the final third just wasn’t paying off. Harry Leddy’s great technical ability was causing problems in the middle for the opposition with his quick feet and mazy dribbling. Leddy found Bristow in the box, but instead of giving the return ball he went alone and went on to shoot wide. Rovers finally got their third as they nailed Lodge in their own half. Rob Sykes forced the keeper to pull off a great save, but Lewis Goodacre was quickest to react with a well struck effort. Rovers tried to run down the clock but lost possession in the away sides half. A Lodge defender launched a ball over the top that should have been dealt with, but the forward took his goal with great control and precision to lob Flowerdew. This was always going to be a hard-fought derby fixture, but Rovers managed to grind out the result and bag another three points. The referee’s man of the match was Banks, while the manager’s star man was Josh Pilmoor. Rovers face a crunch clash at home to second-placed South Cave United Reserves this weekend. Telegraph did not have a game last Saturday, and the third-placed side are due to return to Division Three action at home to pacesetters Queens County. Bridlington Town County’s game at Hodgson in Division One was washed out, as was Bridlington Town Reserves’ Humber Premier Division One game at Howden also fell victim to the wet weather. Only one match survived in the Driffield & District League as Bishop Wilton hosted Spread Eagle. Wilton were quick out of the blocks and it was former Spread winger Eli Preston who came back to haunt his teammates with a double, while Scott Lapworth and Mark Hughes also netted, along with an own goal put the game out of sight. Spread’s response was from Scott Hosey. As the ground got heavier, tempers frayed a little, including a penalty box scuffle, but the teams battled on to the end with Bishop Wilton running out 5-1 victors. This Saturday, Flamborough entertain Nafferton, Northcote Stars play host to Martonian and Pocklington 4ths head to Spread Eagle. The league play their final 2018 fixtures on December 15 and resume January 5.